Researching ‘The Uncanny‘ in relation to visual arts, personal encounters and sensations and buildings. My initial sketch for my project related to the deteriorating residential ‘haunted’ building and I associated this with the uncanny. In reference to E. Jentsch and S. Freud the main aspect of the german word ‘Das Unheimliche‘ is linked to the fearful and emerging aspect of something hidden though familiar. An uncanny sensation can derive from ambiguous and blurred forms especially between living beings and objects. In that case the ‘heimlich (hidden, concealed but also familiar)’ merges with the ‘unheimlich (uncanny)’. At the end of the 19th century the ‘uncanny’ associated with horror was quite popular, gothic, E.A. Poe ‘House of Usher‘ etc. In modern times paintings by E. Hopper or later by Giorgio de Chirico depicted the sense of alienation in an urban environment, an uncanny sensation. One aspect that comes back to me is architecture and the embodied experience of architectural features as I described in my research on Moving images, architectural images and the embodied image relating to cinematic pictures by A. Hitchcock and A. Tarkovsky. Cinema films as ‘North by Northwest‘ or ‘The Birds‘ are building on architectural elements and the psychological response by the viewer. 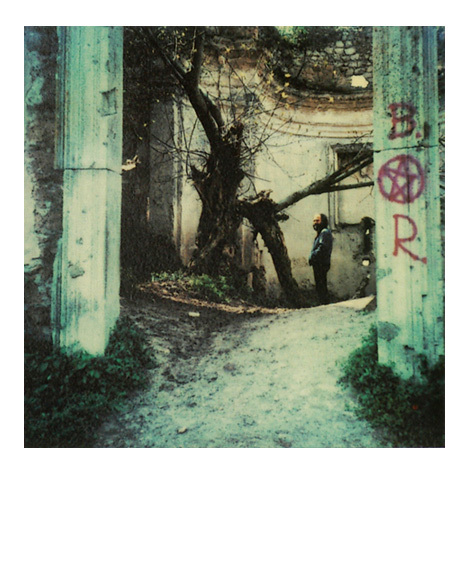 Tarkovsky did a series of polaroids from his neighbourhood. Old polaroids do evoke a certain eerie atmosphere because of the distinct color (greenish-brown) appearance – see example. Translated into painting I would see the unique monochrome appearance alongside blurred forms as if behind a frosted window. Reminds me of me project work on ‘Window – painting #1‘ and not-recognition. Visiting the deteriorating building reminds me of the familiarity of a home. And through the deterioration and open, disclosed parts of the external walls an unhomely sensation occurs. What was once cozy and homely became exposed, interior became exterior. I was wondering whether other aspects do make it so unhomely and uncanny. Looking further on architecture and the uncanny I came across Anthony Vidler who wrote the essays about ‘The Architectural Uncanny: Essays in the Modern Unhomely‘, 1994. As I am more interested in the visual images of it, I looked further for hints linked to architecture and the uncanny. Donald Kunze reviewed the application of Vidler’s argumentation at the example of Hitchcock cinema film ‘North by Northwest‘. I do sense that there might be some elements that I could possibly use for my paintings. His conclusions are that “the uncanny can be viewed technically, in terms of employment of anamorphosis, the inside frame, scale inversion, and the in-ventive (visual) application of the Lacanian idea of the “master signifier.” (Kunze 2008). A famous example of a visual anamorphis is the painting ‘The Ambassadors‘ by Holbein. I discovered eventually the Irish artist Felicity Clear (b. ?) who works large scale with graphite drawing and acrylic on paper. Available from: http://www.felicityclear.com/ and the essay ‘Place(s) Without Place‘ by Cliodhna Shaffrey (2007). Clear is playing with space and illusion, to mystify and to touch the impossible knowing, the unpresentable. Her works let the uncanny sensation resurface. Her series of small scale multiples with a scene player over and over again is playing with memory and repetition, with a sense of déjà vu. Often her works do convey a sense of not belonging, distant. The depicted place is rather a visual space, but not really a homely place. I found out that most works evoking uncanny sensations and upsetting the viewer’s gaze were done between 1880 and 1920. A time period of the late Victorian era and the evolvement of psychoanalytic by Sigmund Freud and others. A period of the revival of the Gothic aesthetics and Symbolism and the rise of Expressionism: fearful, frightening and a sense of despair of the individual in society. The University (UH) Berlin provides a seminar about ‘Literatur- und Kunstgeschichte des Unheimlichen 1900-1920′ (literature and art history of the uncanny 1900-1920). Several books and paintings as well as movies are listed in the agenda. Mainly paintings of the German Symbolism e.g. Alfred Boecklin (1827 – 1901) ‘Die Toteninsel (The Isle of Dead)‘, 1880-1886 and Eugen Bracht (1842 -1921) ‘Gestade der Vergessenheit (The Shore of Oblivion)‘ less contemporary works. Boecklin did five paintings and Bracht two as a series of the same theme. Quite interesting to see that both made only a few changes on an otherwise similar picture. However, the quite picturesque depiction of the scenes do not resonate with me. Also mentioned in the agenda is the movie ‘Das Cabinet des Doktor Caligari’, 1920 by Robert Wiene. One of the german expressionistic cinema. Besides the narrative, I find especially the expressionistic inspired visuals and depiction of interior spaces in a graphic visual style fascinating. Oblique walls, distorted forms and twisted city scenes with awkward spatial orientation evoke unsettling and uncanny sensations. Many of them painted directly on canvas alongside painted shadows and streaks of light. It is said that R. Wiene tried to build the film on Alfred Kubin’s graphic style. Overall I can see that Hitchcock might be inspired by this film. The visual style of The Cabinet of Dr. Caligari included deliberately distorted forms, and shadows and streaks of light painted directly onto the sets. And at some point I can see some link to Francis Bacon’s use of architectural lines and spaces. Searching for more ‘uncanny’ works I searched for the german word ‘unheimlich’, first because of S. Freud strong influence and the raise of the German expressionism around the same time. I discovered a recent exhibition at the Kunstmuseum Bonn (20.10.2016 – 29.01.2017) titled ‘Unheimlich – Innenräume von Edvard Munch bis Max Beckmann (The Uncanny Home)’. A pity that I just missed it. Shown works by: Edvard Munch, Max Beckmann, James Ensor, Léon Spilliaert, Pierre Bonnard, Édouard Vuillard, Odilon Redon, Vilhelm Hammershøi, Alfred Kubin, Erich Heckel, Karl Hofer. The exhibition was covering the period between the Nabis, Symbolism, Expressionism and ‘Neuen Sachlichkeit’ (New Objectivity). The depiction of interior rooms conveying a sense of the uncanny, darkness, isolation and violence. One key message from the exhibition text is: “The works exhibited .. visualize an experience of existential significance. The message that they-literally-bring home to us is that our hopes of a safe space affording happiness and protection against an increasingly complex world are liable to be disappointed even within our own four walls, and that not even at home are we necessarily at home.“(Kunstmuseum Bonn). Some works by Léon Spilliaert (1881 – 1946) do remind me of Edward Hopper (see my research post – click here), with much of an expression of loneliness, isolation and despair. A painting that reminds me of Edgar Allen Poe is ‘Self Portrait in Mirror‘, 1908. The awkward perspective enforced by the interior architecture. The other one is ‘Vertigo‘, 1908 (reminds me of the Hitchcock movie) with bold black/white contrast and extreme stairs vanishing downwards. Edgar Munch (1863 – 1944) ‘Abend auf der Karl Johans gate’, 1892 evokes through its frontal confrontation with pedestrians on the street with blank eerie sight uncanny sensations. Alfred Kubin (1877 -1959) ‘The White House‘, 1906 looks like a normal landscape painting with houses along a river. The bold whiteness of the center house compared with muted colors of the surrounding space is unsettling. I looked than for other sources of contemporary art and found information about the Parasol exhibition ‘Magical Surfaces: The Uncanny in Contemporary Photography’ (Art Chanel, 2016). One aspect I learned here is leading the viewer’s eye into the image and at certain details that may contrast with the surrounding environment. Quite a narrative, e.g a fireman shopping for a pumpkin as the farmhouse — whose fire presumably brought him to there — burns in the background, playing with the parodox (Joel Sternfeld ‘Mc Lean Virginia December 1978‘) In the case of that image one should now that the viewer might get the wrong idea as the fire was a controlled training exercise and the firefighter was on a break. Thinking about truth and perception. But it the perceptive response to an image not what counts initially? Overall, I can see that the uncanny was well explored in the 19th century and in modern art. The question is what I can contribute to that emotional inner sensation with my paintings. I looked up Adrian Ghenie (available from: http://www.pacegallery.com/artists/144/adrian-ghenie )and Daniel Pitin (available from: http://www.nicodimgallery.com/artists/daniel-pitin) besides the memories works by Uwe Wittwer (available from: http://www.uwewittwer.com ) where I do feel more connected to from a painting approach. The oneness of the external wall as re-surfacing what should be concealed from view. Aspect of human absence evoking ‘ghostlike’ atmosphere. Inversion: inverted colors – like photographic negatives. The familiar is feeling strange. A series of painting and/or drawing that together provided unsettling information as seemingly disconnected, e.g. still reflection in canal, stillness of nature, man-made signs, broken wall, darkness inside etc. Bonett, H. (2008) ‘Vilhelm Hammershøi – The Poetry of Silence‘ Exhibition catalogue The Royal Academy of Arts.